Colp, Ralph, and Keller, Manelva Wylie. 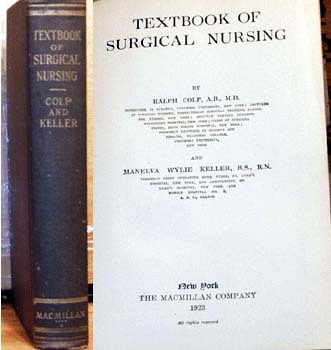 Textbook of Surgical Nursing. New York: MacMillan, 1923, 453 pp. Colp, Ralph, and Keller, Manelva Wylie. Textbook of Surgical Nursing, index, 153 illustrations. New York: MacMillan, 1923, 453 pp. Size: 5.5" x 8.5" x 1.5"